Quinnipiac men’s ice hockey head coach Rand Pecknold always thought the 2012-13 Bobcats were the best team he had ever coached. The program advanced to its first-ever Frozen Four that season, ultimately losing to Yale in the championship game in Pittsburgh and falling just short of its first national title. But now – after finishing the 2015-16 regular season as the No. 1 team in the country, winning the ECAC Hockey Tournament and advancing to the program’s second Frozen Four – he’s starting to change his mind. For now, Pecknold and the current Quinnipiac roster are focused on the 2016 Frozen Four, which kicks off on Thursday night in Tampa Bay. The Bobcats (31-3-7) will face Boston College (28-7-5) for the first time ever at Amalie Arena at 5 p.m. with a trip to the national championship on the line. 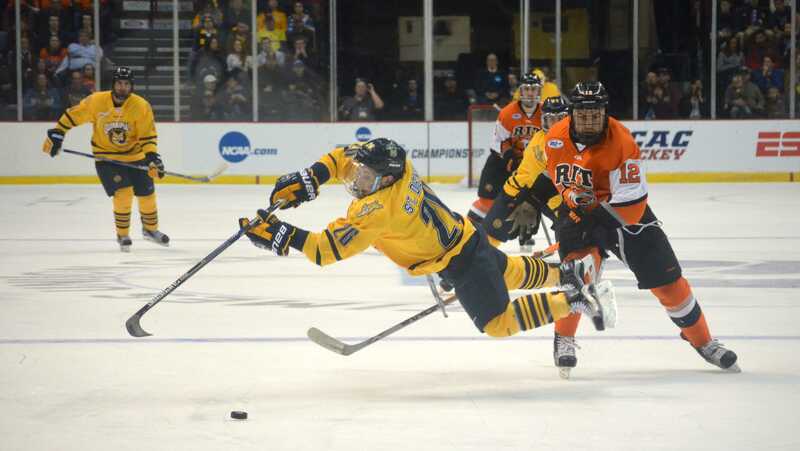 Quinnipiac topped RIT 4-0 in the first round of the NCAA Tournament on March 26 in Albany, then downed UMass Lowell the following day with a final score of 4-1 to advance to the Frozen Four. Since then, the Bobcats have been preparing for their chance to win the program’s first national championship. The break has given Quinnipiac an opportunity to get healthy. Pecknold said that some of the “banged-up” players took a few days to rest following the regionals, but have been practicing all week to prepare for Thursday night’s game. One of the Bobcats’ players that might have gained the most from the layoff is junior assistant captain Sam Anas, who was a game-time decision for both games in Albany. “[The time off] definitely helped,” said Anas. The Bobcats and Eagles enter the Frozen Four as the nation’s No. 4 and No. 5 ranked offenses, respectively. Defensively, Quinnipiac has surrendered 1.90 goals-per-game to Boston College’s 1.98. The top concern, for Jonzzon, is making sure that Quinnipiac doesn’t take pressure off at any point. Pecknold said that, aside from St. Cloud State, the Bobcats have not faced a group as talented as Boston College. Quinnipiac goalie Michael Garteig, who finished first in both games played (41) and wins (31) this year, said that he thinks the Bobcats need to simply stick to their identity. Garteig has only given up three goals in his last four games. He made 27 saves and recorded a shutout against RIT in the first round of the NCAA Tournament, then made 14 more saves against UMass Lowell to help Quinnipiac win the East Regional. But now, Garteig has turned his attention to remaining sharp over the break and getting ready to face the Eagles – who have reached the Frozen Four 25 times in program history. The Eagles have six players with over 30 points on the season, headlined by Ryan Fitzgerald (23 goals, 23 assists). Pecknold thinks the Bobcats need to apply pressure on Boston College goalie Thatcher Demko early. Demko has registered a .936 save percentage to this point and is one of three finalists for the Hobey Baker Award, which honors the best player in college hockey. Quinnipiac’s offense, on the other hand, features five players with over 30 points on the year. Anas, who had a goal and an assist in Albany, leads the way with 24 goals and 26 assists on the year. And for Jonzzon, making the trip back to Hamden with two more wins and an NCAA title would complete the 2015-16 Bobcats’ set of goals dating back to the beginning of the season in October. “I think we’re definitely focused on the opportunity to win a national championship,” Jonzzon said.